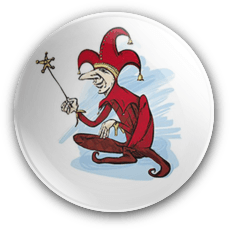 We've awarded Bovada Casino our Court Jester Badge. There were numerous complaints from customers stating that there credit cards were double charged. At times without the player's consent. Yes it does. Although it is not licensed and regulated in the United States it's regulated in a legal jurisdiction (Kahnawake). You must be 21 or older to wager at the site. Progressive wins are included in the daily weekly withdrawal limit. If a player wins $100,000 Bovada will pay this amount as quickly as possible. There were complaints from players that Bovada's games (Roulette and Blackjack) are rigged. Withdrawals take longer than they state on their website, especially for US players. The operator also charges 4.9% on all deposits. Bovada Casino formerly known as Bodog is operated by Meadway Leisure Limited and licensed in the Canadian jurisdiction of Kahnawake. The operator caters specifically to players from the United States of America. It is the flagship casino within the Bodog Group it belongs to flamboyant and extravagant billionaire Calvin Ayre. Bovada has been online since 2007, a playground for sports betting, casino, poker and horse racing enthusiasts. The operator caters to mobile players and fully mobile responsive. The web casino can be accessed from smartphones like Android, iPhones and tablets. Powered by Realtime Gaming, Proprietary (In-house) and Betsoft software, it offers a suite of 220 casino games available in the download or ‘Instant Play’. The game library is made up of a variety of 3D slots, table games (blackjack, poker and roulette), video poker, progressive jackpots, keno, scratch cards and bingo. New players receive a welcome bonus of up to $600. The bonus is not compulsory and available to first time players only. There are two distinct bonuses. The first is a slots bonus of up to $400 (WELCOMESLOTS). The second is a bonus of up to $200 (WELCOMEGAMES) which can be used to play table games like blackjack or video poker. The slots bonus of up to $400 can be used to play any slots machine. Before a withdrawal is permitted you must roll over the deposit and bonus sum 25 times (50xb). Truth be told this is quite steep. The second bonus (WELCOMEGAMES) of 100% up to $200 carries a wagering requirement of 40 times your purchase plus the bonus amount (80xb). The bonus cannot be used to play the following games: mini games in sports and horses, single deck blackjack, double deck blackjack, baccarat, sic bo, craps and roulette. Concerning this bonus let’s put things in perspective quick. It is steep I know, however, you must ask yourself the following: Am I going to use it purely for entertainment purposes or do I want to use it to win some money? If it is the former it’s a great incentive to extend your playing time. However, if you want to use it to take some cash from the casino forget about it. The play-through attached to it is completely out of kilter. Bovada uses a separate balance. Just like at a land-based casino players must first purchase chips. The chips can be used to play at the casino whilst the cash balance can be used to play Poker, Sports or Horse Racing. Players who want to play poker can transfer cash from their Casino Balance to their Cash Balance. Since it only accepts players from America, Bovada does not offer many deposit and withdrawal options. The casino’s customer support can be contacted 24/7 via email (online form) or telephone. Unfortunately a live chat facility is not available. The operator endeavors to respond to all emails with a period of 90 minutes. A ‘Casino Game Guide‘ is available to new players, it explains the various game rules and also gives some valuable tips. Bovada Casino lists the usual player-focused tools. Problem gamblers can request a cooling-off period for a specific period up to 6 months to indefinite. The operator also offers deposit and session limits. In other words you can decide how much cash you want to wager within a certain period. I’m happy to see that the operator offers incentives to its returning players and that it’s not just another ‘cash-grabbing’ online casino.You can also swing by ‘The Lounge’ and check out the latest offers that gives you more bang for your buck. You’ll receive 2 comps for every $10 wagered on slots and mini slots. 1 Comp for every $10 wagered on blackjack, mini blackjack, mini roulette and other casino games. On single and double bet blackjack you’ll earn 1 comp for every $25 wagered. Bovada Casino employs the usual security protocols such as encrypted software (SSL). Strictly speaking any third party other than the operator won’t be able to gain access to your personal details. In addition the site also states that your personal information will not be disclosed neither will it be sold to any third party. In summary. Bovada Casino is a reasonable choice for US players. At one stage its RTG gaming suite looked a bit drab but the addition of the Betsoft games spiced things up a bit. There are two things I don’t like about the casino. The first is the steep play-through attached to its bonus offers. The second, some players complained that their credit cards have been double charged. Bovada can improve its withdrawal processing time and add more deposit and withdrawal methods to its current cashier section. Otherwise recommended. 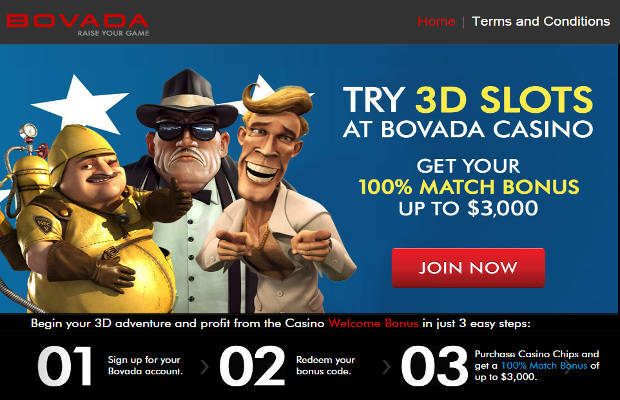 Bovada offers loyal players two types of promotions. The first, loyalty points can be earned through its weekly casino rewards which has no play through requirements. The second includes bonuses and lucky draws which are announced from time to time. Mobile Casino Bonus: First time mobile players receive a $10 free chip. Over the course of a promotional week you must wager at least $250 to qualify for it. Before the bonus or any cash can be withdrawn from it, it’s subject to a roll over requirement of 20 times. If you want to get a sneak peak about the operator’s latest promotions click on the ‘Casino Promotions‘ tab. It offers daily, weekly and weekend promotions to active players. Suffice it to say Bovada Casino is not an idle operator and definitely lives up to its name sake in this department. If you accept any additional bonus just make sure that you understand its terms and conditions. Refer a Friend Bonus: For every friend your refer you’ll receive 200% of your friends first deposits up to a maximum of $100. Deposits can be made via American Express and MasterCard and withdrawals only via cheque only which can take up to 25 business days. Bovada endeavours to process all withdrawals within a period of two weeks. In the event your credit card is declined you can phone the casino. Cash can be sent via Western Union or Money Gram. Cheques will be sent via courier, ACH or Western Union which normally takes up to 5 business days whilst ACH and Western Union takes 3 business days. The maximum amount that can be withdrawn per transaction is $3,000. Bovada includes a suite of 200+ games powered by Realtime Gaming and Betsoft. The Betsoft 3D slots machines offer bonus rounds, additional free spins, wilds, scatters and multipliers. From an entertainment point of view the graphics are crisp and flushed with colorful animations. 3D Slots: The Betsoft slots are slick and replete with eye catching animations. We recommend Safari Sam, A Night in Paris, Arrival and Gladiator. In Arrival players must pay attention to the sneaky alien who operates the spaceship. Some of the other games that can be played are 2 Million BC, At the Movies, Aztec Treasure, Barbary Coast, Black Gold, Enchanted, Gold Diggers, It Came from Venus, Lost, Mad Scientist, Mr Vegas, Slots Father, Treasure Room, Viking Age, Under the Sea. Table Games: Baccarat, Blackjack, Craps, Roulette and different varieties of table poker. Progressives: Bovada offers up to 51 progressive games each with its own progressive jackpot. At the time of writing the largest progressive jackpots were Mid Life Crisis and Shopping Spree which stood at $1.5 million plus a piece.